This is one of the stories that we’ve heard on the Anti Raids Network’s Know Your Rights stall on Deptford High Street this summer. The idea for the stalls started when one of us learned that some local shops have been raided four times this year already, with the immigration authorities blagging their way in with talk of faulty gas meters and electrical checks. Shop workers and customers have been questioned for hours, and local residents scared away from their own high street. 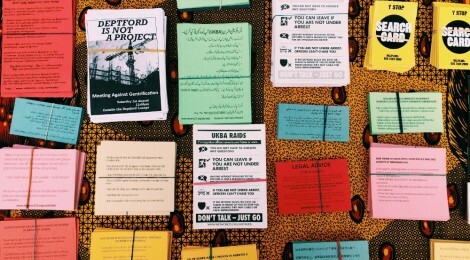 Across London, communities are fighting back against these multi-agency raids. Sometimes it’s been as simple as surrounding the immigration authority’s vans and making some noise – making it clear to the authorities that they’re not welcome in our communities. This is what happened in Peckham in May. Enforcement officers were surrounded, and eventually forced to hide out in a butchers shop until they could get away. A month later in Walworth, it took three vans of riot cops, six police cars and some dogs to remove one guy detained by the authorities. News of the raid spread by word-of-mouth and social media, and the authorities were faced with improvised barricades and flying fruit and veg. Although sadly one guy was taken by the authorities, if every immigration raid was met with that level of resistance it would seriously screw up the State’s ability to deliver these raids. In July, an attempted immigration raid being sabotaged by locals in Shadwell, East London. Sixteen van tyres were let down and officers were egged – a similar reception to the previous month in Walworth. To make matters worse for the immigration cops, they had were accompanied by media in a bid to do a spectacular “tough on immigration” stunt. The cops were called, and sadly two people were arrested in the incident – but who knows how many more arrests and detentions there would have been without community resistance? When people step up and show each other solidarity, we can make immigration checks and raids a lot more difficult. We can do this not only by physically confronting the authorities, but also by knowing our rights and telling others about them. You DO NOT have to answer any questions. You DO NOT have to tell them your name or address. Tell them that you do not want to talk to them. You can find more news and information on the fight against immigration raids from the Anti-Raids Network, as well as information about your rights, translated into more than twenty languages. It’s time to make some noise.